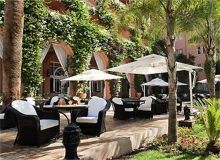 A beautiful luxury hotel & spa in in the prestigious Hivernage area of Marrakech providing exclusive accommodation and 5-star guest amenities in the beautiful green setting of its Oriental gardens. Boasting 3 fabulous restaurants and relaxing SPA facilities, this peaceful 5 Star haven has a contemporary design style and is situated just 1 km from the hectic city centre offering a total of 277 air-conditioned guestrooms with all the amenities for a comfortable stay. First 5* all inclusive in the new touristic area of Marrakech. Encrusted like a precious jewel in a ten hectors’ setting, combining a full range of leisure activities with the best in contemporary design.